Members of the Ohio Detectors Association agreed to come out and use their expertise and equipment to help Wilmington police search for shell casings from an Oct. 30 shooting on Hawley Avenue in the city. 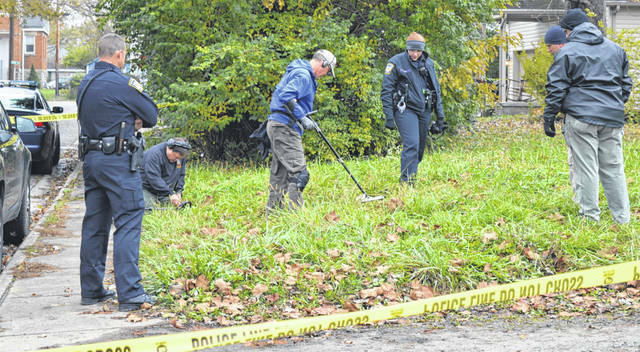 In this photograph from Friday afternoon, Nov. 9, Wilmington Police Department (WPD) officers and the detectors organization members comb a grassy area along Hawley Avenue in hopes of finding casings. A suspect, Leon Turner Curtis, 37, of Wilmington, was arrested on Oct. 31. The victim was transported to Miami Valley Hospital, but is no longer a hospital patient, according to WPD.